Opened CDs - items 50 to 75 Shop MyMusicFix!! 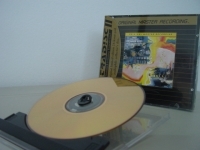 MFSL 24K Gold Near Mint+ Open CD with J-Card. 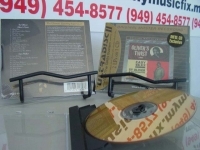 Tracks Include: "Fantasy Is Reality/Bells Of Madness" "Put Your Big Toe In The Milk Of Human Kindness" "White-Wheeled Limousine" "Country(Bass Trilogy: Part 1)" "Zillionaire" "Dustin' Off The Bass" "Easy Answer" "Satisfaction(Bass Trilogy: Part 2)" "Home Is Where You Get Across" "Spike's Bulls (Bass Trilogy: Part 3)" "Gypsy One" "Gypsy Two" "American Popsicle". 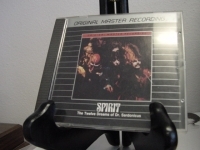 "Spirit, The Twelve Dreams of Dr. Sardonicus - Mint MFSL Aluminum CD - currently out of stock"
"Sting, Nothing Like The Sun - MFSL NEAR MINT OPEN CD"
MFSL 24K Gold 1st Edition Japan Pressing Near Mint Open CD Detailed item info Track listing 1. Lazarus Heart, The 2. Be Still My Beating Heart 3. Englishman In New York 4. History Will Teach Us Nothing 5. They Dance Alone (Gueca Sola) 6. Fragile 7. We'll Be Together 8. Straight To My Heart 9. Rock Steady 10. Sister Moon 11. Little Wing - (with Gil Evans) 12. Secret Marriage Details Playing time: 55 min. Contributing artists: Andy Summers, Branford Marsalis, Eric Clapton, Gil Evans, Hiram Bullock, Mark Egan, Mark Knopfler, Ruben Blades Distributor: n/a Recording type: Studio Recording mode: Stereo SPAR Code: DDD Album notes Personnel includes: Sting (vocals, guitar, bass); Fareed Haque (guitar); Ken Helman (piano); Kenny Kirkland (keyboards); Manu Katche, Andy Newmark, Kenwood Dennard (drums); Mino Cenelu (percussion, vocoder); Dolette McDonald, Janice Pendarvis, Vesta Williams, Renee Geyer (background vocals). Producers include: Sting, Neil Dorfsman, Bryan Loren. Recorded at Air Studios, Montserrat. Includes liner notes by Sting. 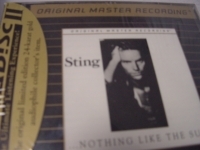 Sting's double-length follow-up to his solo debut DREAMS OF THE BLUE TURTLE is very much in the same sophisticated, adult pop vein, although darker and less jazzy (notwithstanding a collaboration with Miles Davis's arranger Gil Evans on a cover of Jimi Hendrix's "Little Wing"). The songs are a generally varied lot, ranging from a tribute to victims of repression in Argentina ("They Dance Alone") to a tongue-in-cheek, sort-of-reggae tribute to famous eccentric Quentin Crisp ("An Englishman in New York"). The sort-of-funk "We'll Be Together"(originally written for a Japanese beer commercial) is the most upbeat and pop-ish thing here, and was deservedly a hit single, although Sting now disdains it. 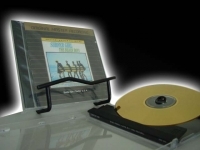 "Sy Oliver, Oliver's Twist & Easy Walker (2 LPs in 1 CD)"
"The Beach Boys, Surfin USA & Surfer Girl - CURRENTLY OUT OF STOCK"
DCC 24K Gold Japan Pressing Near Mint Open CD, voted the #60 album of all time. 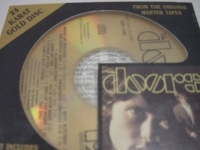 Tracks Include: "Break on Through" "Soul Kitchen" "The Crystal Ship" "Twentieth Century Fox" "Alabama Song" "Light My Fire" "Back Door Man" "I Looked At You" "End of the Night" "Take it as it Comes" "The End"
"The Moody Blues, Days Of Future Passed - CURRENTLY OUT OF STOCK"
MFSL 24K Gold Near Mint+ Open CD, Japan 1st Generation Ultradisc Pressing. 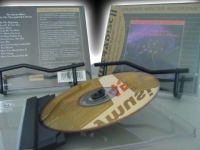 Tracks Include: "The Day Begins" "Dawn: Dawn Is a Feeling" "Morning: Another Morning" "Lunch Break: Peak Hour" "Tuesday Afternoon (Forever Afternoon)" "Evening: the Sun Set: Twilight Time" "Night: Nights in White Satin"
"The Moody Blues, On The Threshold Of A Dream"
MFSL 24K Gold Mint Open CD. This 1969 release features the purveyors of classical rock in all their sonic splendor. Highlights are "In The Beginning" "The Dream" "The Voyage" and more! 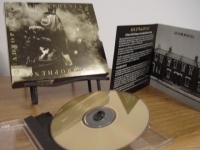 Includes a reproduction of the long Out of Print Booklet of Lyrics originally available. 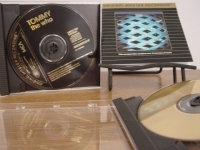 "The Searchers, Meet The Searchers & Sounds Like Searchers"
"The Who, Quadrophenia 2 CD Box Set - MFSL Near Mint God CDs"
"The Who, Tommy - Near Mint"
MFSL 24K Gold Near Mint Open CD. With this 1969 release, The Who became the pioneers of the Rock Opera, and along with it came some of the most inspired work by the band, or just about anybody, ever produced. 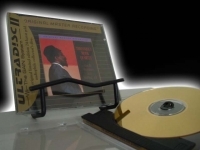 "Thelonious Monk, Live At Monterey Jazz Festival 1963 (Vol. 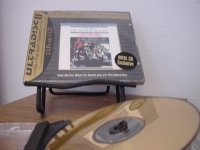 I) - Mint MFSL Gold CD"
"Tom Petty & the Heartbreakers, Hard Promises with J-Card - CURRENTLY OUT OF STOCK"
MFSL 24K Gold Mint Open CD. 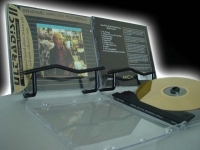 Follow-up to Petty's 1979 platinum monster Damn the Torpedos was this multi-platinum release. A solid marvel of lush, emotionally charged rock gems. 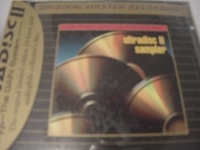 Tracks Include: "The Waiting" "A Woman In Love (It's Not Me)" "Nightwatchman" "Something Big" "Kings Road" "Letting You Go" "A Thing About You" "Insider" "The Criminal Kind" "You Can Still Change Your Mind"
"Ultradisc II Sampler, Various Artist"
MFSL 24K Gold Near Mint+ Open CD with J-Card. 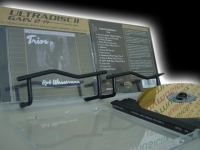 Features Eric Clapton "Lay Down Sally" Traffic "Low Spark Of High-Heeled Boys" Cat Stevens "Wild World" Rush "Tom Sawyer" Count Basie "April In Paris" The Moody Blues "Ride My See-Saw" John Hiatt "Thing Called Love" Robert Cray "Smoking Gun" and more! 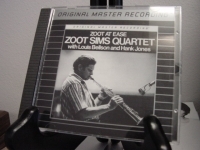 "Zoot Sims Quartet, Zoot At Ease - Mint MFSL Aluminum CD"